The portable machine tool of the future. 12/11/06: hextatic has been festering in its box; in the meanwhile i've managed to get hooked on the idea of a mini-hexapod "hex-chan" using pager motors, and draws power and commands off a USB bus! This will allow me to try out some of the ideas slated for the motherchip without getting bogged down in details. Hextatic is still under development as well, so don't worry. 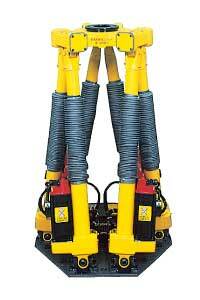 The variable length struts all point directly towards the end effector. All force vectors are directly along a strut. There is only tension or compression, and no bending anywhere in the (ideal) structure. This leads to a very rigid and lightweight structure, similar in function to a geodesic dome. The total error is averaged over all six actuators, instead of accumulating error as in a stacked slide (milling machine) or serial rotary joint mechanism (robot arm). Similarly, wear is evenly distributed. All six actuators work together to move the platform, providing higher power/weight ratios since less time is spent idle per actuator. The high rigidity and low mass allow for very high acceleration rates, making feasible techniques such as high speed machining and active vibration compensation. The machine is composed of multiple identical parts, greatly simplifying manufacture, design, and repair. It is easily disassembled, shipped, and reassembled on-site. 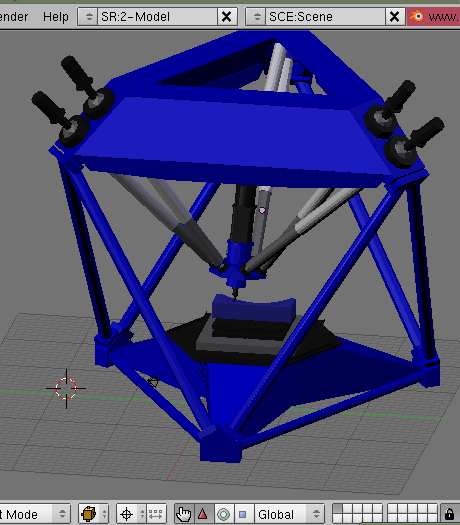 Machines with an enclosing frame (such as the ingersoll octahedral hexapod ) do not require heavy foundations or precision leveling. Under construction. Sorry! Well, would you rather have me work on a real-life model, or sit here and write about what other people are doing? The F-200iB has a functional work envelope in the shape of a cylinder, with diameter 500mm and height 300 mm, but the full work envelope is a complex lenticular shape about 1 meter in diameter and 500mm in height. Repeatability is within 0.2mm. The robot is 800-1300mm tall, 630mm in diameter, and weighs 190kg. It is capable of moving a 100kg payload, has a maximum speed of 1.5m/s, and is primarily intended for welding and assembly applications. Just to give you some idea of what the run of the mill hexapod is like. Most folk ignore "Hexapod" as a patented/trademarked word much the same way we ignore the "Windows" thing when we put clear panes of glass in our homes. If it becomes a problem with cash down the line, call it a Stewart Platform. That is well beyond the experation date. I am carefully avoiding any mention of "that other hexapod robot" that is really stupid and serves no purpose whatsoever. Also avoiding any terms that are commonly used to describe it, so that people searching and doing a NOT boolean operation won't cancel out this page. Based on "PukiWiki" 1.3 by yu-ji. Powered by PHP 5.3.2-1ubuntu4.5. HTML convert time: 0.647 sec.